Instrument calibration, Equipment Calibration, Calibration Process, Calibration Calendar, Calibration Procedures all are basics fundamentals of the Laboratory requirements as per ISO 17025. Equipment Calibration is basic requirements of Laboratory who are calibrate for the external in coming equipment / instruments are used for various measuring materials / tools by various methods. Calibration Process and its Procedure are much important same as calibration testing that all are follows as requirements of equipment / instrument’s required parameters which are defined standard for calibration. Details of Equipment: As requirements of international standards are equipment’s all the concern details should be mentioned in report to identify, monitor & also for traceability of the each equipment which is previously calibrated in laboratory., Generally there as usual equipment name and & identification no, model and its makers name, range of equipment can possible measuring. All the fields are very important for traceability of equipment. Details of equipment Calibration: Calibration Process is not simple as we describing, some instruments are need to trace for the understand the basic limitation that are records in previously calibrated are also some equipment are need to special testing that should be cover in equipment history. As same Calibration Period are basic command from calibration calendar are maintain. Standard / method used of calibration field is much important for the quality laboratory that should be mentioned very clear to verification team can identify the equipment’s required test and its real standard or method can possible to verify, all the verification are base on standard methods that should be very state to approval of calibration process. 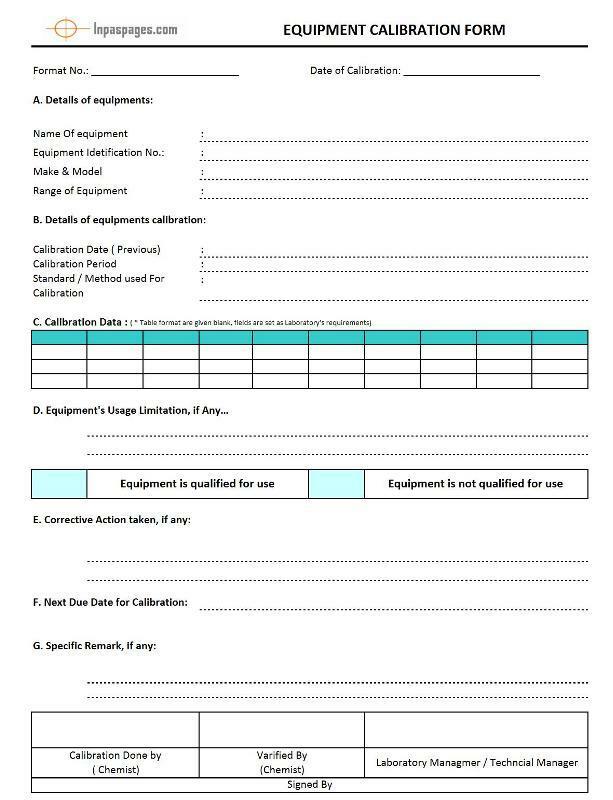 Calibration Data: This fields are mandatory requirements, here as above picture you can see the fields are blank reason is there are all depends on laboratory, each Lab are used different standards, parameters and fields are used as requirements of laboratory. Equipment’s usual limitations: This field is depends on previous records & calibrator’s experience, further during calibration this limitation show by performer, this fields will be used when required. Before the calibration of any device needs to classification for the analytical devices can be classified under two categories like equipment / instrument, because both the works are different to another, instrument is used to collect the scientific data and measurement of results hence the equipment refer to the various supporting tools used for performing analysis in the laboratory / processes. It is very important that, choose the right instrument for the calibration to start the monitoring instruments as per calibration processes and guidelines, it cannot compensate for the inherent performance limits of the instruments it calibrates. Control of Inspection Measurement and Test Equipment – A process to calibrate/verify all of the measuring and check equipment, needed to provide evidence of conformity of product to determined requirements, including employee and customer owned equipment. This shall include equipment identification (measurement standard against which the equipment is calibrated) and statements of conformity to specification after calibration/verification. So, every equipment are needs to verify qualification & calibration necessity before the used in processes, basically demonstrates that the equipment works correctly and really leads to perfect and consistent outcomes. And confirms that on an on-going basis that the equipment performance appropriately.